A good-looking leather chair is one thing, but a comfortable chair is usually another. The expanded line of leather seating from the Mayline Group offers the best of both worlds. Whether the need is for distinctively styled and affordable executive and guest leather office chairs, uniquely designed models for orthopedic needs, or chairs for the big and tall, we have the style and price to fit nearly every office environment. Every leather chair is backed by Mayline's limited-lifetime warranty and in stock for shipment within 72-hours. QUALITY, STYLE and COMFORT with the commitment of service you have come to expect from the Mayline Group. Ultimo Leather Chairs offers distinctive styles and luxurious comfort you would expect from high-end chairs, but at a fraction of the price. Crafted with top-grain leather, sculpted dual-density foam, detailed stitching, and full-featured adjustments, Ultimo leather chairs are the ultimate in executive, conference and task seating for the discerning office and proves the top of the line is attainable while protecting the bottom line. The attainable luxury of the Ultimo Series can be yours! The Series 100 High-Back has generously-sized sculpted deep cushions, padded leather cantilevered armrests, and a deluxe knee-tilt control. The Seat Height is 19" at its lowest point and 22" at its highest. The Series 100 Guest has sculpted cushions. 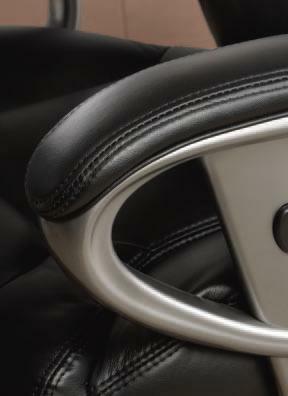 padded leather armrests. and a tubular steel frame. The Seat Height is 20". The Series 100 Mid-Back has sculpted cushions, padded leather loop armrests, and a deluxe knee-tilt control. The Seat Height is 19" at its lowest point and 22" at its highest. The Series 200 Mid-Back has ultra soft, perforated leather cushions, padded leather loop armrests, and a deluxe knee-tilt control. The Seat Height is 20 1/2" at its lowest point and 23 1/4" at its highest. The Series 300 Mid-Back with Synchro-Tilt has the same features as UL350H but with a 2-to-1 synchro-tilt control. It has an adjustable height and width, and padded leather armrests. The Seat Height is 19 1/2" at its lowest point and 22 1/2" at its highest The Series 300 High-Back has a thickly padded contoured leather seat and back, padded leather loop armrests, a deluxe knee-tilt control, and a pronounced lumbar support. The Seat Height is 20 1/4" at its lowest point and 23 1/4" at its highest. The Series 500 EZ-Assemble Mid-Back is easy to assemble, no tools are required. It is accented with gathered seams on seat and back. It has padded leather loop armrests and a durable steel frame construction. The Seat Height is 20 1/2" at its lowest point and 23 1/2" at its highest. The Series 500 EZ-Assemble High-Back easy to assemble, no tools are required. It is accented with gathered seams on seat and back. It has padded leather loop armrests. It does not ship UPS. It has a durable steel frame construction. The Seat Height is 20 1/2" at its lowest point and 23 1/2" at its highest. The Series 600 ECO-Leather High-Back has double layered body pillows, soft padded cantilevered armrests (pivot vertically), and a Knee-tilt seat mechanism. 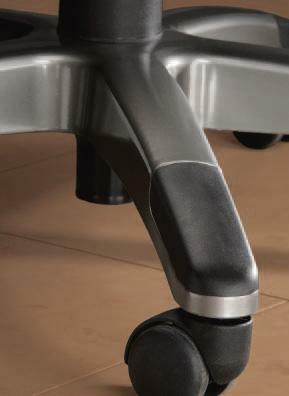 The seat height is adjustable with tilt tension/lock functions. It is made with up to 76.54% Recycled Materials. The Seat Height is 20" and the arm height is 26 3/4". The Series 600 ECO-Leather Mid-Back has double layered body pillows, soft padded cantilevered armrests (pivot vertically), and a Knee-tilt seat mechanism. The seat height is adjustable with tilt tension/lock functions. It is made with up to 79.57% Recycled Material. The Seat Height is 20" and the Arm Height is 26 3/4".